We carry SCC Super Z 6 & Super Z 8 -- also Super Z LT and Shur Grip Z SNOWCABLES along with QuikGrip link SNOWCHAINS in most sizes -- also have V-bar reinforced "icebreaker" SNOWCHAINS for exceptional grip in mud and snow. Personal one-on-one instruction, installation demonstration included with every snowchains, tirechains, or snowcables set purchased. "SNOWCHAINS 101" spoken and taught here. for the best fitting SNOWCHAINS around. Serving clients from San Diego, La Jolla, Malibu, Los Angeles, Hollywood, Mt. Laguna, Pine Valley, Glendale, Burbank, Anaheim, Pasadena, Culver city, Santa Monica, Laguna Beach, Newport Beach, Huntington Beach, Thousand Oaks, Orange County, Big Bear, Mammoth, Tahoe, and points further north and east. if you can endevour to bring your vehicle HERE for fitment. We HAVE your "impossible to find" snowchains sizes! A NIGHTmare story of poorly fitted snowchains! I have SNOWCHAINS TIRECHAINS and SNOWCABLES to fit most cars, trucks, suvs, rvs, 4x4s, even motorhomes, tractor-trailers, and tour buses. Each set of SNOWCHAINS, TIRECHAINS, or SNOWCABLES is an EXACT fit, everytime. Unique installation device of my own design included with every set. PLEASE NOTE-- I do *NOT* ship SNOWCHAINS -- NOR do I offer carry-out sales without pre-fitting. 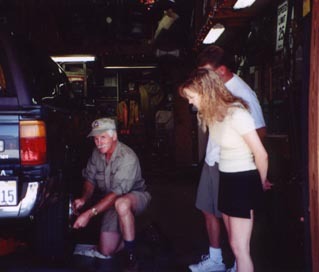 You must be able to present your vehicle here in San Diego for proper fitment and instruction. This ensures that the snow traction devices I provide fit perfectly, and allows me to impart to you SNOWCHAINS101 ---the tricks and tips that I have learned from more then 40 years of installing them on all types of vehicles. I serve the San Diego County area mostly, but, that said, if you are willing to travel whatever distance you must to present your vehicle for fitting, I stand ready to serve you. I have had folks come from as far as Arizona, Nevada, and Northern California -- even TEXAS -- when they were unable to find chains to fit properly on their SUVs. Yes, I can fit Saturn and Mercedes Benz! Have you Hummer, BMW, Range Rover, Escalade, Porche, Audi to Toyota, Nissan or subcompact -- we HAVE your snowchains! One winter's day on Mt Laguna, I was proceeding down hill on the Sunrise Highway -- in my 2wd,rwd, 55 Ford SAR rig, chained only on my rear drive wheels -- vehicle in front of me wasn't chained at all -- we came to an exceptionally icy stretch - down hill curve - and the lead vehicle began to fishtail slowly then overcorrected and slid off the road and over the side - rolling over several times before comin up against a big pine tree which stopped it's fall -- watched all of this in kinda slow motion. I, in my adrenalin racin excitement, turned to the side to pull over to render aid -- all was well -- UNTIL -- I braked to stop! My SAR rig continued straight [ w the wheels turned left ] in the skidpath of the previous vehicle till finally stoppin -- with -- I'm shure -- my RF tire hangin in the air over the edge of the road! Well -- I said a leetil prayer, threw it inta reverse, backed up and lined up better w the road edge -- bailed out and ran to assist the unfortunate driver and his passengers outa their battered vehicle [ was on it's side ] luckily, no one was hurt moren bumps & bruises. From that day to this, I chain up ALL FOUR TIRES so that I kin steer as well as move. Nearta had to clean my seat! folks are all the time askin me what I recommend as far as to how many tires to chainup -- I say "from experience -- "